The Wars tells the story of a young Canadian man who becomes a soldier in WWI. It’s about what war is like, what it can do to the soldiers who fight, and how it can effect the families and friends of the soldiers who fight. In the end, for Robert Ross, it is about how he can, in the midst of violence and ugliness, commit to life instead of death. Timothy Findley’s descriptions of the horrors of WWI are vivid and real. But he takes the story a step further to include life away from the trenches. Life looks different through the eyes of a soldier who has been at the front. Findley also takes us back to Ontario where Robert’s family is missing him and thinking of him. Each of his family members reacts differently to his absence. My opinion was – he was a hero. …You see, he did the thing that no one else would even dare to think of doing. While the War was going on around him, Robert was fighting his own internal war. He was young, he was seeing so much trauma and madness. He had left his home shortly after a family tragedy. There were decisions being made that didn’t make sense to him, or didn’t seem right. How hard would it be to have to carry out orders that were against your beliefs, values, or even just your common sense? This… was the greatest terror of war: what you didn’t know of the men who told you what to do-where to go and when. What if they were mad-or stupid? What if their fear was greater than yours? Or what if they were brave and crazy-wanting and demanding bravery from you? Mud was invented here. Mudland must have been its name. The ground is the colour of steel. Over most of the plain there isn’t a trace of topsoil; only sand and clay. …When it rains (which is almost constantly from early September through to March, except when it snows) the water rises at you out of the ground. It rises from your footprints- and an army marching over a field can cause a flood. In 1916, it was said that you ‘waded to the front’. Men and horses sank from sight. They drowned in mud. Their graves, it seemed, just dug themselves and pulled them down. I doubt we will ever be forgiven. All I hope is – they’ll remember we were human beings. 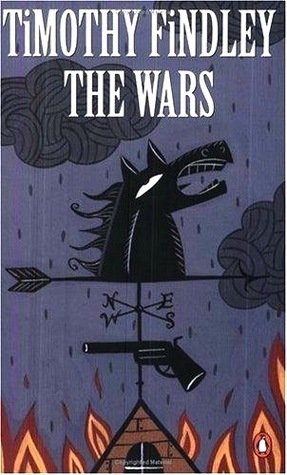 The Wars by Timothy Findley won the Governor General’s Award for Fiction in 1977. Any thoughts on The Wars? Another wonderful WWI book is Three Day Road by Joseph Boyden. Has anyone read any others? I’m kind of obsessed with WWI — I wrote an over-long undergraduate thesis on it — and there are so many wonderful books about it. I’m going to do a roundup as June 28 approaches. You’ve just given me two more titles to read — I’m not as well versed in Canadian fiction. I love reading about the wars. I can’t wait to see what good books you’ve read about WWI. And if you’re obsessed with WWI, you have to read Three Day Road! There’s no way around it. And then tell me what you think! This one’s good too, but shorter, and not as completely mesmerizing. I’m glad you read The Wars. So different from Three Day Road. Both are great (Canadian) books about WWI. I’m glad I read it too! It’s made me want to read more WWI books, as well as another Findley book. And re-read Three Day Road. I don’t think I’ve read a ton of WWI. . . I’ve read a ton of WWII, but not much WWI (American or other). I have also read more WWII than WWI, but when I do read about it, I always want more. Your post just makes me realize I need to read more WWI! Isn’t this an anniversary year for WWI? I’ve had in on my mind to read more books about WWI, but I’m not sure if that’s going to happen this year. What did you think of Timothy Findlay as a writer? I thought his writing was excellent, and I will definitely read more of his books at some point. It will depend on my mood, I think. There are lots to choose from. Both Headhunter and Not Wanted on the Voyage look good to me. I remember this book being sad, just desperately sad. I read it in University and loved it. Somehow I haven’t read any more Findaly but want to get to Not Wanted on the Voyage. Not Wanted on the Voyage would be my next choice, too. We should get Rick right on that- he had it on his list.